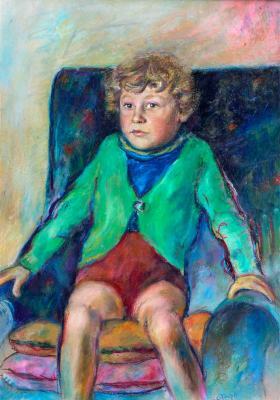 What is perceived here instantly is the nervous vitality of this restless little boy who, although his hands are clutched tightly to the arms of the chair, seems just about to move, to change his posture once again. Nevertheless, the static quality of his features, the eyes fixed steadily on the viewer, suggest something deeper that transcends mere movement: there is a spirit within, a soul which is eternal (or rather, eviternal; that is, beginning in time, but having no end). The eternal present, then, is captured in the living quietude of the boy’s face. In its apparent simplicity, this painting is an unusual case. Exceptional for its extreme lyricism but, at the same time, balanced. All of its pictorial elements are infused with spirituality; excepting the small areas of the painting in which the background medium (paper) shows through, there are scarcely two square centimetres of uniform colour. All is vibrating, palpitating, with the soul transmitted by the craft of the pictorial process; nothing remains inert, impermeable to this imbued spirit... But this subjectivism, taken to an extreme in extracting from the medium (wax crayon) all of its expressive possibilities, is not drowned in mere formalism; it serves, rather, the objective communication of spiritual realities, so mysterious and ineffable to human beings; it reaches deep within that which “modern art”, to a great extent, has forgotten, and this is the spiritual dimension of man. “The arts of the 20th and early 21st centuries have stopped viewing man as a being with a spiritual dimension, and have thus transformed him into a simple visual object” (José Jiménez Lozano, winner of the 2002 Cervantes Prize).